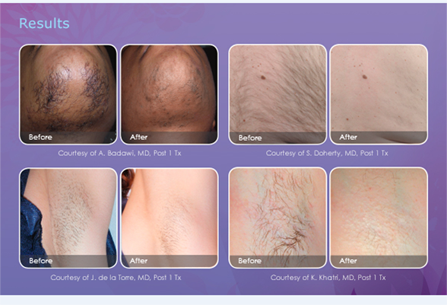 Are you tired of tweezing, waxing and shaving your unwanted hair? Tired of the time, mess and expense? If you’re a woman, body hair is one of the most aggravating things. We spend a lot of time removing unsightly body hair – apparently about 72 days of our life is spent on shaving just our legs according to the latest shaving statistics on Google. The thing about shaving, waxing, plucking and hair-removal creams is that the hair grows back in no time flat and you can feel the stubble. Stubble does not equate to smooth and silky skin. Noydeen Beauty is pleased to offer the state-of-the-art hair removal technology that effectively treats unwanted body hair. Laser hair removal uses a laser light energy to gently remove unwanted hair and put an end to the hassles of constant shaving and waxing. During your hair removal process, the laser light passes over an area of skin to treat your hair follicles. With laser hair removal you can get the touchable skin you’ve always wanted. All you need is a few simple treatments to get lasting results. The secret lies in the technology that targets and destroys hair cells responsible for hair growth without harming the surrounding skin. This treatment is fast, easy and practically pain free. At Noydeen Beauty, we can help you get to the root of the problem with our state-of-the-art laser system. Laser hair removal gives you effective, permanent hair reduction anywhere on your body including the face, legs, back, underarms or bikini line. Treatments are quick and easy letting you get back to your everyday activities. Call Noydeen Beauty and schedule your consultation today.